Beijing Forest Police today announced the arrest of 16 suspects in a major wildlife trafficking case code-named “May 21”, which led to the confiscation of wildlife products including 804.4 kg ivory, 11.3 kg rhino horn and 35 bear paws. Beijing Forest Police told a press conference the seizure was the biggest ever in terms of the scale of the smuggling operations behind it. Police said the total value of the haul was in the region of RMB24 million (almost USD4 million). The criminal gang behind the trafficking were said to possess their own processing factory, warehouses and vehicles for transportation. The three month operation uncovered a trafficking ring that led from Japan through Hong Kong to mainland China, where the gang was said to operate across a network that ranged from Guangdong to Shandong and Beijing, using antique shops as cover for their operations and using online illegal trading and couriers for their distribution. “TRAFFIC applauds the Beijing Forest Police for this successful operation, which has helped dismantle an entire smuggling ring and the infrastructure that goes with it,” said Zhou Fei, Head of TRAFFIC’s China Programme. The Beijing Forest Police announcement came just days after China and the United States made a joint political commitment “to take significant and timely steps to halt the domestic commercial trade of ivory” during the recent visit by Chinese President Xi Jinping to the US. In July, the United Nations passed a General Assembly Resolution on Tackling the Illicit Trafficking in Wildlife. “The Beijing Forest Police operation is a clear demonstration of the Chinese Government’s commitment to crack down on illegal wildlife trade and support international efforts to protect endangered species. As a Chinese proverb aptly says: ‘Action is far more powerful than words,’” said Zhou Fei. It is possible all the wildlife products in the case originated in Japan, where the popularity of legally owned items such as ivory and rhino horns from the 1980s and earlier has plummeted and people have been selling family heirlooms and other goods into the marketplace. Information from the Elephant Trade Information System (ETIS) database, which TRAFFIC manages on behalf of Parties to CITES (the Convention on International Trade in Endangered Species of Wild Fauna and Flora) indicates that ivory trade between Japan and China was first recorded in 2005 but really began developing from 2009. Through 2014, some 56 seizure cases have involved nearly a tonne of ivory, and rhino horn and a bear skin have been seized on at least two occasions. According to information released at the press conference, since 2013, Beijing Forest Police has cracked 222 cases involving illegal wildlife trade and arrested 108 suspects. 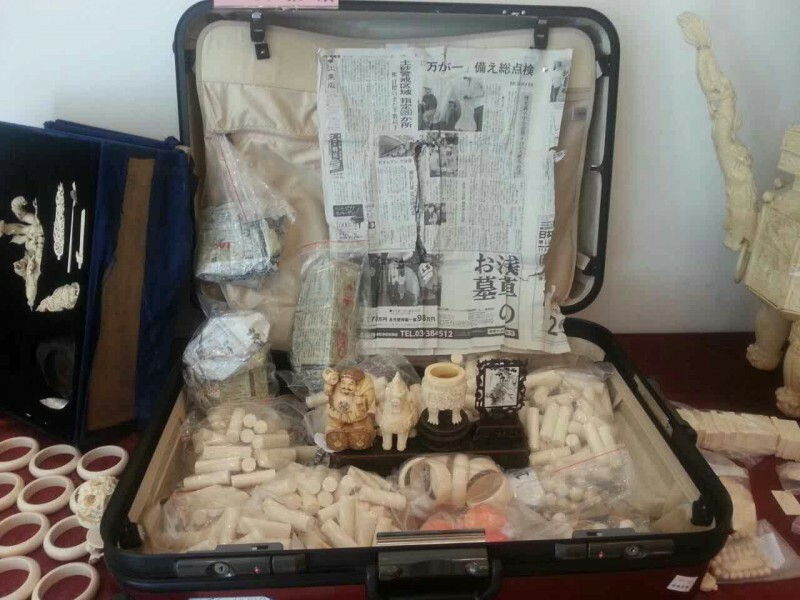 1321 wildlife products worth around USD7 million, including 1527 kg of ivory have been confiscated. The latter figure includes the 804.4 kg seized from the smuggling ring. Beijing Forest Police have reminded members of the public not to consume illegal and endangered wildlife products and to report any suspicious activity to the police or forest police. They also confirmed their commitment to monitoring online and physical markets for illegal wildlife sales and to preventing poaching and illegal exploitation of wildlife.